"I just converted a VOB file (2.3 GB) using DVD shrink. I want to split the VOB up into separate clips (it contains different music videos). I just tried using MPEG video wizard. I selected the portion, then exported to DVD mpeg. It takes about 15 minutes to do a 3-minute clip. Is there easier way to do this?" Like the man above, maybe you've converted a lot of VOB files from your music DVDs. And also, you're looking for a simple way to cut each song into a single file. In this case, you can use Wondershare UniConverter (originally Wondershare Video Converter Ultimate)(Wondershare UniConverter for Mac (originally Wondershare Video Converter Ultimate for Mac)) to cut VOB files into several segments and export each clip into a new file quickly and easily. 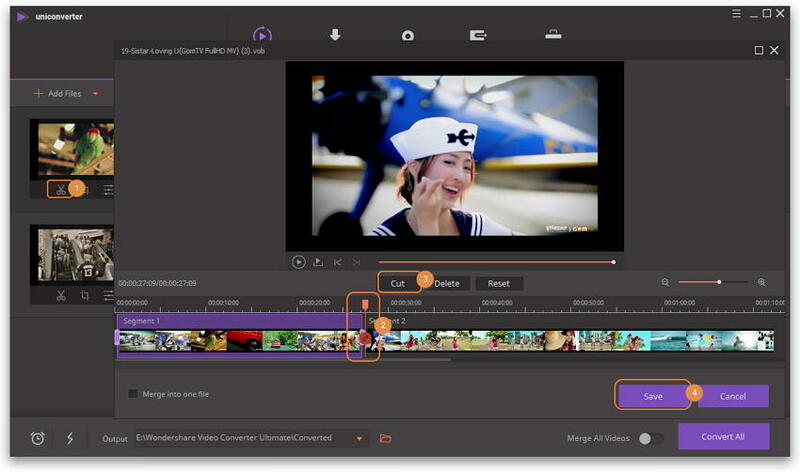 Compared with other video editing tools, Wondershare VOB cutter saves more time for you. Apart from cutting VOB files to any length exactly, it gives you the ability to export all your wanted VOB clips into different files in one go, simplifying your work greatly. Convert VOB to MP4, AVI, MOV, WMV, FLV, MKV and other 1000 formats. Convert multiple VOB files to MP4 in batch without any quality loss. I'll show you how to cut VOB files in the windows version of the VOB video cutter step by step. Step 1 Add VOB files to this VOB cutter. Click the Add Files button to load VOB files from the computer to this VOB video cutter. Immediately, you'll notice the corresponding VOB file bars have been added in the pane of this program. Alternatively, you can add VOB files by simple drag and drop. Step 2 Cut VOB into clips. Click the Trim icon under the video thumbnail which you want to cut, in the popping-up "Trim" window, there is a time slider of the video progress bar. Separately move the slider to set the beginning and ending time, and then click the Cut to extract the selected video clip. If you only need to cut the video into several clips, then you only need the Cut button; if you want to remove some part, you need to click the part and click the Delete button. Step 3 Export all VOB clips. Click the inverted triangle to enter the Output Format pane, and then choose VOB and its resolution in the Video category, if you want to convert these videos to other format, you can choose MP4, MOV or else too. You're optional to revise the video names by needs. At last, press the Convert All button on the lower-right corner of the interface to start exporting all VOB files. When the conversion is done, click the Output icon, you'll find each VOB clip is saved in a single file. Second part, top ten best VOB cutters with main features. This cutter is powerful in cutting MP3 files. Apart from VOB, It is also able to support a variety of files such as FLV, MOV, MP4 and others. The free cutter enables you to create ringtones and tunes, cut audio clips for movies or songs or cut the audio to smaller parts. You can also control the volume as well as the language because there are 38 different language options available. Using Simple MP3 Cutter 4dots is indeed simple because you only have to open the video, click start and end button and then save or preview. The cutter is one of the best cutters that convert VOB to MP4 for playback purposes. It is also capable of grabbing images and saving them as PNG file formats. It is fast, virus free and has quality video encoding properties enabling high quality videos and audio. WinX Free VOB to MP4 Converter also comes with the following customized editing features. Video/Audio settings to create good image and sound effects. Trimming- coverts VOB to MP4 by defining starting and ending time. The cutter supports a range of files including avi, and MP4. It also supports some processors such as the Athlon 64 X 2 and Intel(R) Pentium D Dual-Core. You can complete the cutting task within a few minutes with more than 300% speed. Secondly, its use is not complicated and both professionals and beginners can comfortably use it. Free Video Cutter Pro v1.0.2 automatically identifies hardware configuration and then applies appropriate cutting schemes. You simply need to click the start and end buttons using the mouse or drag and drop these options. 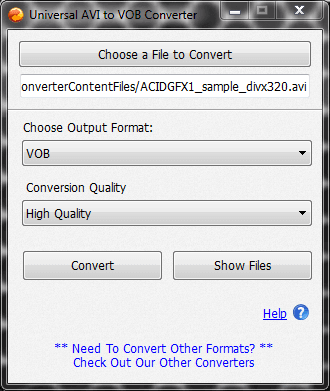 The converter converts AVI file formats to VOB in less than five seconds. This displays its high performance and ease of operation. The design is also straightforward and anyone can use Universal AVI to VOB Converter v1.0. All you have to do is download the file online, free of charge and then follow the installation instructions. After that, choose the file to be converted and the quality standards preferred. Lastly, press the convert button and use the progress bar to monitor the conversion process. This is a cutter that cuts various files like mp4, mpg and VOB to other formats like avi and mp4. Weeny Free Video Cutter v1 2 enables you to cut videos excluding adverts or trailers. You can also customize options according to your preference. You can change the video order, frame bitrate and codec. You are also free to rename or even adjust the size, volume as well as quality. 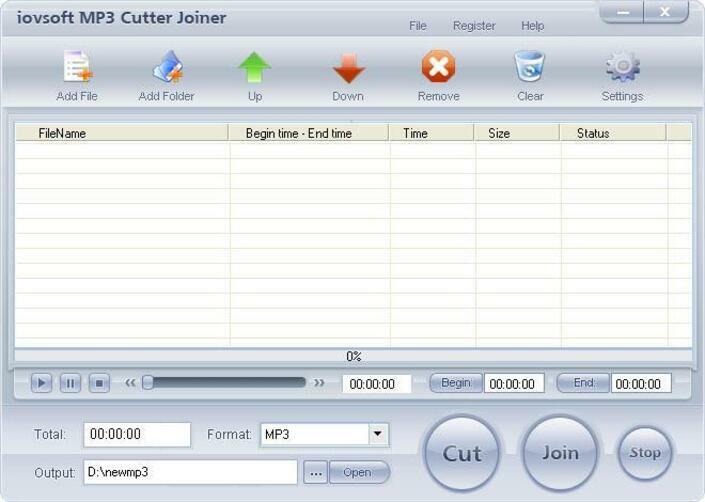 If you want to cut an audio file or join a number of video files together, then work with free iovSoft MP3 Cutter Joiner v3.06.09. Its configuration consists of a charge free MP3 cutter and joiner. You can access highlights thanks to MP3 cutter and join them altogether. Free iovSoft MP3 Cutter Joiner v3.06.09 will examine the functions for you and choose error free settings to begin and end the function. It readily supports LAME encoder, OGG coder, MP3 VBR and OGG VBR too. You can simply cut your MP3 music files thanks to My Mp3 Spliter v1.0. It is certainly user friendly and you can enjoy high quality audio clips. When using this program, simply download your MP3 file and create the best ringtone. The free Chick Video Cutter v2.350 will enable you to either cut or slit your videos. It is also known as the Video splitter, Video clipper or Video cutter. From these names, you can tell that you can get many clips from a single video file. You can also join them to get the desired size and length. The utility supports a number of files including AVI, MP4, DIVX and many more. 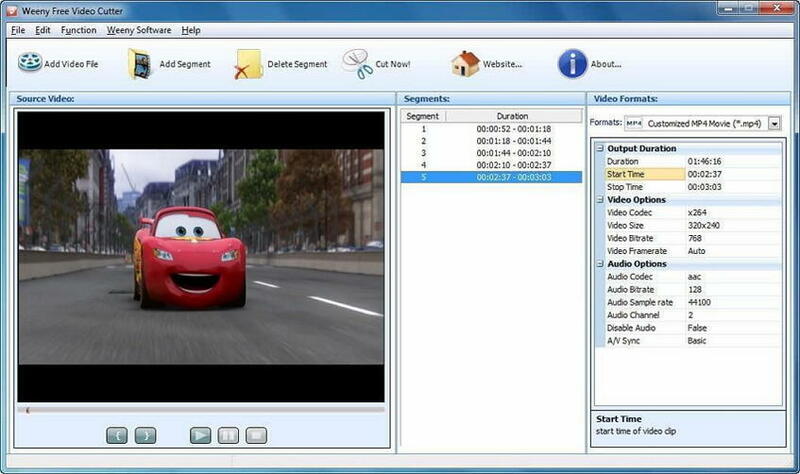 Chick Video Cutter v2.350 has a high compatibility range because it can be used on all Windows software. Its speed is impressive and so is its quality maintenance.